Posted on June 22, 2018 by treelawyer	tagged. 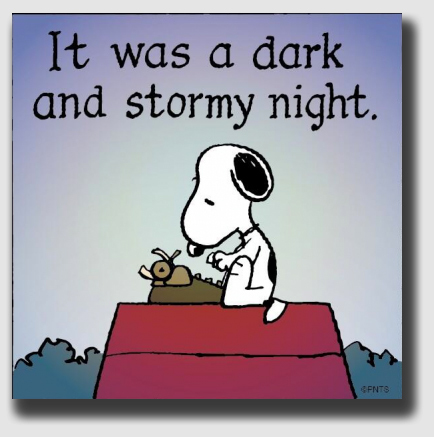 Snoopy made the opening line of Paul Clifford one of the most famous in the history of pedestrian writing. Or so begins Edward George Bulwer-Lytton’s 1830 novel, Paul Clifford, the opening line now famous thanks to Snoopy in the comic strip Peanuts and the fiction contest that bears the author’s name. It’s a bit ironic: we are enjoying as much light today as any time this year (well, all right, three seconds less than yesterday, to use Boston as an example, but that’s a rounding error). Yet today we’re going to look back on a really dark and stormy night, when the aptly-named farmer Hay drove his truck through the Ohio countryside, past the golf course owned by a local lodge of the Benevolent and Protective Order of Elks. On this particular dark and stormy summer night, an oak tree by the side of the road, weakened and decayed after a lightning strike several years before, fell on Farmer Hay, bringing to a sudden end his time on this mortal coil. Subsequently, his estate sued the Elks, claiming the Lodge had been negligent in failing to do anything about the hazardous tree, despite the fact that its decrepit state was well known to the duffers. Relying on rather thin precedent, the trial court threw out the Hay descendents’ claim, holding that a rural landowner had no duty to protect travelers on the highway from the natural condition of trees on his or her property. The matter reached the Ohio Supreme Court in 1951. The Supreme Court began with the observation that the law permitted every landowner to make such use as the person’s property as he or she wishes, provided it is used in such a manner as not to invade the rights of others. It then added flesh to that general rule, holding that while a rural landowner has no duty to inspect trees adjacent to a highway, when he or she has knowledge – actual or constructive – of a patently defective condition of a tree which may injure a traveler, the landowner must exercise reasonable care to prevent harm to people lawfully using the highway. The ALI presciently foresaw evolution of the duty defined in Hay and cases in other jurisdictions that followed it. The Hay rule has since become a standard of care imposed by virtually all states. 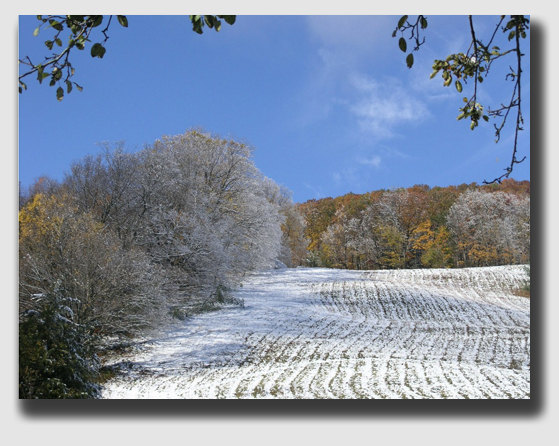 These things happen … but the landowner may be liable, depending on what he knew and when he knew it. Hay v. Norwalk Lodge No. 730, B.P.O.E, 92 Ohio App. 14, 109 N.E.2d 481 (Court of Appeals, 6th Dist., 1951). Farmer Hay was driving his truck on New State Road when a large limb or limbs fell from a tree located on land owned by the local chapter of the Benevolent and Protective Order of Elks. The limb struck the top of the cab, injuring Mr. Hay so that he lost control of the truck, crashed into a tree, and died as a result of his injuries. The late Mr. Hay’s estate sued, alleging that the tree had been struck by lightning several years before, and was extensively damaged and weakened as a result. 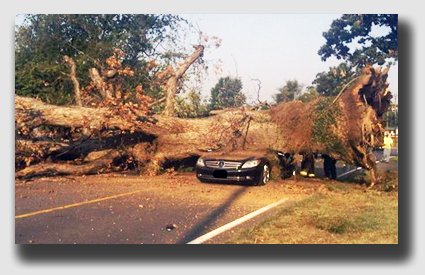 The complaint said the damage to the tree was visible and apparent for several years, and that after the tree was struck by lightning, apparent natural processes of decay set in and further weakened the tree and its branches, which extended over and above the traveled portion of the road. Finally, the complaint averred that the Elks knew that portions of the said tree extended over the road, that it had been struck by lightning, and the tree was thus weakened. The complaint concluded that the Elks had neglected to remove or to brace the damaged portions or to do anything to make the tree secure, and failed and neglected to give notice to motorists of the danger. Held: The Supreme Court reversed, and sent the case back for trial. It held that every person may make such use as he or she will of real property, provided he or she uses it in such manner as not to invade the rights of others. But in the case of rural landowners, this means that although there is no duty imposed upon the owner of property abutting a rural highway to inspect trees or to ascertain defects which may result in injury to motorists, an owner having actual or constructive knowledge of a patently defective condition of a tree which may result in injury to motorists must exercise reasonable care to prevent harm to people lawfully using the highway. Public policy opposes burdening rural landowners with the duty of inspecting their property for hazard trees … but if the landowners know of a problem, they should attend to it. The Ohio Supreme Court observed that the law imposes upon every member of society the duty to refrain from conduct of a character likely to injure a person with whom he comes in contact and to use his own property in such a manner as not to injure that of another. The justices reviewed cases from other states, which led the Court to the “conclusion that in the absence of knowledge of a defective condition of a branch of a tree which in the course of natural events is likely to fall and injure a person in the highway, no liability attaches to the owner of the tree. On the other hand, where the owner has knowledge of the dangerous condition of the tree or its branches, it is his duty to exercise reasonable care to prevent the fall of the tree or its branches into the highway.” The Court agreed with a Minnesota case that held that it was unreasonable to require the owner of rural land to inspect his property with regard to naturally arising defects, because of the burden thereby imposed upon the owner of large and unsettled tracts of land. But the Court rejected the Minnesota case’s conclusion that the owner was not liable even if he had actual knowledge. Because the complaint filed by the Hay Estate alleged that the Elks had actual knowledge of the decayed tree, the complaint made out a claim that, if true, would entitle the Estate to recover. The case was reinstated and sent back to the trial court.